I started out looking for a remote thermometer for my smoker that had three probes: one for the smoker and two for meat. I also wanted to be able to monitor the temperatures via Wifi whether I was inside the house or away from the house. Raspberry PI seemed like a good way to do this on the cheap (compared to solutions on the market) while trying out a fun project. The result of my project is documented here so that others can hopefully take advantage of the work I did. Skip this section if you get the PCB. I ended up mounting the board in a small waterproof box and mounting the 2.5 mm jacks on the outside of the box. This should allow me to leave it out in the rain as long as the jack and power cord are facing down. After it was all buttoned up it looks like below. I put the hole for the power cable on the line between the lid and the box, this way I wouldn't have had to drill a larger hole for the USB connector to fit through. Also, I glued some magnetic strips to the back of the box so it can be attached to the side of the grill (where its not too hot of course). Now I was ready to start reading the temperatures. The basics included a python script that I got from adafruit to read to values from the ADC and log them to a SQLite database. It took some trial and error to determine which formula worked best to convert resistance to temperatures based on the Thermoworks thermistor probe that I was using. A good source for these formula's can be found here. Once I had the temperatures logging to the database every minute via cron I needed a web interface. I already knew I wanted to use node.js and I found the good work that Tomas Holderness had done. I used this as a start and built the web interface from there. I modified quite a bit of stuff and on the highcharts library and how I was reading data into the Highcharts library. I also added in Twitter bootstrap to make the web interface look clean and work across mobile and desktop platforms. All my code is posted on github. I used Twitter bootstrap modals to create a nice popup and send form data to the node.js app. The node.js app then takes the data and lays down the configuration on the filesystem. For example, the ip information received is used to update the /etc/network/interfaces file. The DNS information is used to update /etc/resolv.conf. The wireless setup is pretty straightforward and allows to WPA/WPA2 preshared key. It want to use it in an area where there is no wireless AP to connect to, it also allows for adhoc networking. This will allow you to connect your phone directly to the RPi and view the web interface. Obviously, alerting will not be able to send email in this mode. The last thing I did was add some alerting capabilities. The alerting allows you to set a high and low threshold for each sensor. You can set any of the thresholds to 0 to disable them. There is also a hold down timer that basically defines how long a threshold must be broken before you send an email. In my case, I just have it send an email to my SMS email address for my phone so I will get a text message. I have ATT so I just send an email to 1234567890@txt.att.net and I get nice alerts on my phone. The only other big thing I added was a configuration page to allow a user to change the IP and wireless network settings directly from the web interface without having to go the the shell on the RPi to change them. The popups use the cool modal's that Twitter Bootstrap gives us and then it uses an HTML form to pass the vars to the node server app. The node server app then goes to the filesystem and makes the appropriate changes to the filesystem of the RPi. Specific files it modifies are /etc/wpa_supplicant/wpa_supplicant.conf and /etc/network/interfaces. I was using "Raspbian GNU/Linux 7 (wheezy)" so hopefully this works for everybody. Check out the updates I just made today. I had put this PCB together sometime back but never updated the blog post. Hope this helps. I love this idea but don't know how to code. Would you be willing to build one for me? I love the use case. Very neat project! You did a very good job at laying out what is needed and documenting your code. I may have to try this out! Can't get the web server to work for some reason. Have tried everything. Also, what version of node and npm are you running please? I have the same problem. Is there a known issue? It should give you the same functionality but without having to do any of the soldering/wiring. Also, putting this in a box should be much easier. I have all the parts so I will try your code at some point. Finding a food grade K-type thermocouple is super expensive. The analog type food probes that come with the off-the-shelf wireless devices are much more affordable. 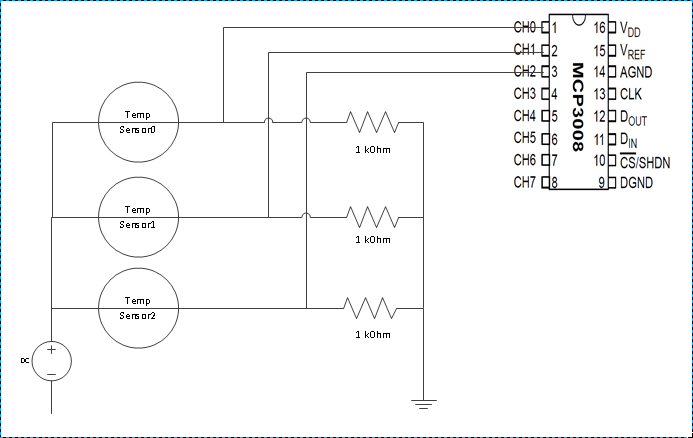 I have tried with various settings (not knowing the exact specs of the thermistor I was given), but everything it's given me for a,b,c results have been extremely incorrect. I really don't remember. See link below for the formula I used with the abc values I used. This should work if you use all the same parts I did. Ok, so ive bought the PCB built it and have tried several times to do the setup. I have the same issue as some have stated above. "insserv: warning: script 'thermserv' missing LSB tags and overrides"
Sorry, I did also try getting the latest node version v4.2.1 & npm 2.14.7 and it didn't work. Are you sure you followed the directions in the readme? You should not have ended up with 0.10.36 if you did. Brilliant! So glad I found this. I've been thinking about starting a PI-based smoker temp probe project for a while, but never got around to it. Stumbling across your page was all the motivation I needed to finally get started. Thanks! Cooking thermometer to measure water temp? Anyone try this with a PI Zero? This is my first Pi project & didn't have too many issues with the instructions. Little stumble with node-sqlite3 & sqlite3. Still working on getting the email alert functioning. Thanks to Tim for posting the how-to & PCB board! I'm having problem on my B+ with Jessie as well and I think it might be the same problem, but I can't come around it like you said you did. Is it possible that you can specify what you did different? Happy to help, but I posted the exact lines I ran to fix it. I tried to keep a running log of every command I entered but instead of posting all that, if you posted the errors & what commands you're running we can isolate the issue. I got it working after a few tries - thanks a lot for your post, it helped me a lot! I think you don't need to do everything below but this is what I did. What was your cost not including the Pi? Very awesome. Glad you guys were able to use this! I still use mine all the time. I love being able to check a brisket while away from the house. It was a great post written on Three probe temperature monitor for BBQ/Smoker using Raspberry Pi. This is really very informative article about monitoring of temperature.very awesome that,you have best try to understand all about temperature using very effective images.i like this very much.although i have searching about grill temperature solution of cooking chicken grill.anyways i have huge learned your content about monitoring temperature. I want to thank you for this article. I've made a slightly different version to tie into some of my existing home components. Using a Pi zero, and your python code (revised) I'm sending my temperature readings every 15 seconds via REST API to my InfluxDB and Grafana stack running on a virtual machine for realtime monitoring and historical graphing. Now, along with all my other HA data points, I can view how my smoker is running and analyze temperature trends over time. I'm trying to install the pibbqmonitor on a raspberry Pi Zero W running Raspbian Stretch Lite Kernel version 4.14. I'm having trouble with sqlite3. i originally tried the instructions on the tilimil/PIBBQMonitor github, which failed. I've also tried the steps used by Lars Fredriksson above, but with the same result. The Putty sysout is pasted below. node-pre-gyp ERR! command "/usr/local/bin/node" "/home/pi/node_modules/sqlite3/n ode_modules/.bin/node-pre-gyp" "install" "--fallback-to-build"
node-pre-gyp ERR! This is a bug in `node-pre-gyp`. npm ERR! argv "/usr/local/bin/node" "/usr/local/bin/npm" "install" "sqlite3@late st" "--unsafe-perm"
npm ERR! Failed at the sqlite3@4.0.0 install script 'node-pre-gyp install --fall back-to-build'. BTW, if I try sudo install sqlite3@latest --unsafe-perm as listed in Lars' comment above it falis (see below), so I assume the npm argument is needed. Try 'install --help' for more information. Hey there! I know this is kind of off topic but I was wondering which blog platform are you using for this site? I'm getting tired of Wordpress because I've had problems with hackers and I'm looking at options scr888 pc for another platform. I would be awesome if you could point me in the direction of a good platform.